The musings of a radical thinker writing on current political, social and ethical issues. I'm a non-conformist who seldom agrees with the broad consensus, so expect controversy. Please make use of the comments box at the end of each entry. As I said, my opinions are controversial and I welcome and ALWAYS print responses no matter what opinion, except if they are personally offensive. Your opinions really DO count! Today is April Fool’s Day and we were the fools who believed the Cameron lie that there is such a thing as “Caring Conservativism”. Since then, he and his cronies must have been laughing all over their faces. Even worse, since Thatcher destroyed our trade union movement and Blair hijacked the Labour Party and swung it even further to the right there has been no effective opposition to the Tory destruction of the Welfare state. Admittedly there are marvellous groups such as the Coalition of Resistance and the Right to Work campaign, but on the whole they cater for existing activists and have done little to draw in new people. The introduction of the bedroom tax - 660,000 people in social housing will lose an average of £728 a year. 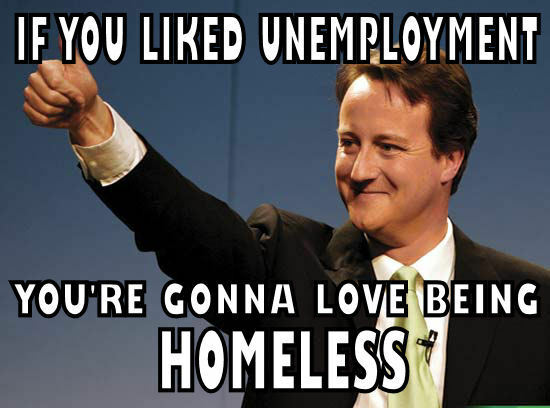 Benefit uprating begins - Nearly 9.5 million families will be affected, including 7 million in work, by £165 a year. As if that isn’t bad enough, Cameron will rub salt into the wood by scrapping the 50p tax for high earners. 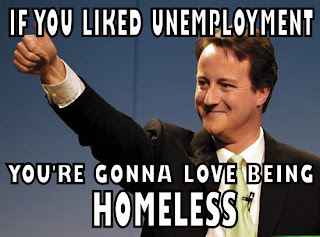 Without doubt it can only be described as a month of shame for the Tories, but they do not see it that way. They remain convinced they are in the right – and without an effective opposition they will undoubtedly stretch things further. Over the coming weeks we must organise an effective opposition. The Labour party has failed to take that lead and though the trade unions have made some effort, the result has been limited. Hopefully the Bedroom Tax campaign will be the start of something powerful – a return to the mentality of the Poll Tax campaign. If we can bring about an effective challenge to the Tories there is a chance we can rebuild the left, but if we fail then we risk obscurity for at least a generation. In tough times, tough decisions must be made. Such is the mantra peddled by George Osborne and co – reinforced in last week’s budget which unveiled further public spending cuts. But while it is happy to push these cuts onto crucial public services, the government refuses to make what most people consider a ‘good cut’. 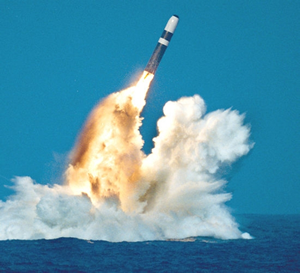 We spend around £3bn annually on running Trident, Britain’s nuclear weapons system. Just in one year. But not only are the Conservatives happy to pay this amount, they’re pushing for a replacement of the ageing Vanguard Class submarines (which carry our nukes) to the tune of more than £100bn. That’s £20-25bn over the next few years just to build them (to which you can add the £3bn per year running cost of our current system), £3bn per annum running costs over the next 30-40 years, and then an estimated £25bn in decommissioning. That’s before we get into the Ministry of Defence’s ubiquitous overruns on major projects: typically delivering them around 40 per cent over-budget. On Easter Monday – April Fools’ Day no less – CND will be continuing a tradition which first brought the issue of Britain’s nuclear arsenal to prominence from 1958 onwards: protesting at the Atomic Weapons Establishment (AWE) in Aldermaston. We’re calling on the government to see sense, with the message: ‘Scrap Trident: Time to Stop Fooling with Nuclear Weapons’. And the issue is not just the untenable economics of Trident replacement – it’s also strategically redundant. The government itself has said that nuclear weapons are not relevant to the kind of security threats we face. In its National Security Strategy in 2010, the threat of state-on-state nuclear attack was downgraded to a tier-two risk. And many in the military agree. Senior figures in the armed forces have said Trident is “completely useless” and concern is growing in the military and Whitehall over its ruinous impact on the MoD’s ability to fund conventional defence forces. The UK's Work and Pensions Secretary, Iain Duncan Smith, has warned young people not to rely on home ownership to fund their retirement. Unveiling a radical overhaul of the state pension, the Work and Pensions Secretary said rising house prices were putting bricks and mortar out of reach. He added it was "absolutely imperative" that the Government took steps to "secure the position of the next generation" and encourage saving. He added that 70 per cent of today's pensioners owned their own homes, but their grandchildren were "struggling to even get a foot on the housing ladder" because house prices for first-time buyers had risen by 40 per cent in real terms over the last decade. "The next generation will not be able to rely on bricks and mortar in the way their parents have been able to," he said. "It's no wonder our children are increasingly cynical about saving." 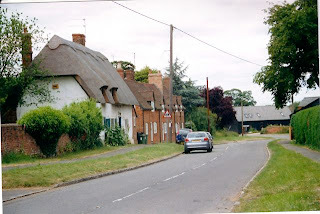 Now Iain Duncan Smith happens to live not too far from the Sage's Castle in Buckinghamshire and I happen to know a bit about his own bricks and mortar. This is such good advice from a person who when he was made redundant had the comfort and support of his father in law, John Fremantle, 5th Baron Cottesloe, who built and gave him a house on his 1,400 acres of land at Swanbourne, in North Buckinghamshire where IDS lives to this day. Iain Duncan Smith is married to Elizabeth "Betsy" Fremantle. As IDS observed during the Foot & Mouth epidemic, he understands the plight of the ordinary farmer. And no doubt the ordinary person made redundant who doesn't have the cushion of an aristocratic father-in-law? 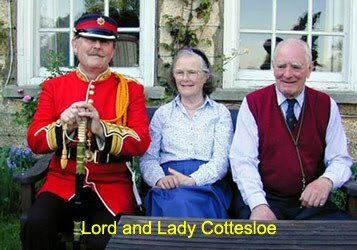 His “ordinary farmer” father-in-law is the 5th Baron Cottesloe. He also inherited the Austrian noble title "Baron Fremantle", which is an authorised title in the United Kingdom by Warrant of April 27, 1932. He was Lord-Lieutenant of Buckinghamshire between 1984 and 1997. An Old Etonian and former naval commander, he owns the Swanbourne estate in Buckinghamshire, which includes the picture-postcard village of Swanbourne, complete with post office, village store, tea-rooms, prep school and houses, plus rolling acres of prime farmland. Lord and Lady Cottesloe live in the Old House, a manor house set in five acres. As Betsy is the Cottesloes' oldest child, the next village squire could be Iain Duncan Smith. Despite attempts by Tory Central Office to present him otherwise, Duncan Smith is resolutely upper class. The Fremantle Family's Betsey Wynne Pub at Swanbourne. The Pub’s name comes from Betsey, who married Thomas Fremantle when he was a sea Captain with the British Fleet in Naples, 1797. Horatio Nelson was the best man. From their prolific union stems the complete Fremantle line of distinguished Naval Officers, including three Admirals and the present head of the family, Lord Cottesloe, who lives at Swanbourne. IDS's wife is named after her and Fremantle, Swanbourne and Cottesloe in Western Australia are named after the family who claimed Western Australia for the crown and founded the Swan River Colony, today Perth. IDS served as a British Army officer in the Scots Guards from 1975 to 1981 and his father was a Group Captain in the RAF. Intriguingly, given his wife's family wealth, his two homes, and his children going to public schools, Duncan Smith has complained that life as an MP had been "a financial disaster”. From his aristocratic marriage, military background, free house and personal wealth of over £1 million he is able to understand the hearts and minds of the ordinary men and women of Britain. A Newsnight investigation in December 2002 found that Iain Duncan Smith's CV contained 'inaccurate and misleading' claims about his education. 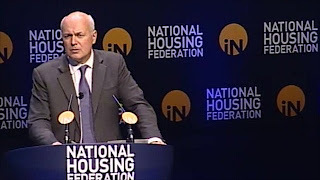 The investigation found that Duncan Smith's biography on the Conservative Party website, his entry in Who's Who, and various other places, stated that he went to the Universita di Perugia in Italy. It transpired instead that he had attended the Universita per Stranieri, which is also in Perugia; however the University did not award degrees when Duncan Smith attended in 1973. When challenged by Newsnight, Duncan Smith's office confirmed that he 'didn't get any qualifications in Perugia or even finish his exams'. The first line of Ian Duncan Smith's biography on the Conservative Party website claimed that he was 'educated at Dunchurch College of Management'. Dunchurch was the former staff college for GEC Marconi, where he worked in the 1980s, again Duncan Smith's office confirmed to Newsnight that 'he did not get any qualifications there either, but that he completed six separate courses lasting a few days each, adding up to about a month in total'. John Garside, a former Dunchurch tutor, told the Newsnight investigation team 'I'm puzzled, flattered, but puzzled. What we did was offer short courses… it was not a continuous form of education by any means. There have been plenty of soft options for IDS who became an arms salesman through the Old Boys network after his short six year Guards career in the army and had his house built for free on his father in law. Lord Cottesloe's, land when he was made redundant after six months in the only real job he ever had. He also (as an MP) took six months off work in 2009 when his wife Betsy was diagnosed with breast cancer. Is this another case of do as I say, not as I do? IDS is 58 years old and has suckled upon the publicly-funded teat for most of his life. He's signed on the dole. He's had four children and received child benefit for all of them. He has put them each through private school, too. His wife hasn't worked since they married, except for 15 months in which he got her a job paid by the taxpayer. He and his colleagues eat and drink food you subsidise in a palace you pay for, he is driven around in a car you own, and when he is too old to 'work' any more you will pay for him to have a better pension than you, too. He started out at the age of 21 with six years of taxpayer-funded military service, during which he acted as bag-carrier to a Major-General. Then in 1981, aged 27, he left the Army and signed on the dole for several months. He then began a period of ordinary work based upon the skills he had gained at the taxpayer's expense, and worked in sales for arms dealer GEC-Marconi. He then moved on to a property firm, where he was made redundant after six months, and then sold gun-related magazines for Jane's Information Group. After 11 years of this all-too brief career he succeeded in once again boarding the publicly-funded gravy train in 1992. In the intervening 20 years he has been paid by the taxpayer every year more money than most taxpayers earn. He has topped it up, along the way, to more than six figures for a few years here and there. In 2001 he helped his unemployed wife to have a suckle, arranging for you to pay her £15,000 to be his diary secretary. These days he is given the grand total of £134,565 a year from the taxpayer. He lives for free in a £2million Tudor farmhouse on his father-in-law's ancestral estate in Buckinghamshire. He has three acres of land, a tennis court, swimming pool and some orchards, which is not bad for a life in the pay of the state. 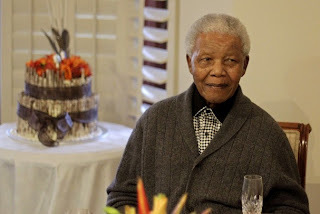 It is a worrying time despite South Africa's presidency saying 94-year-old Nelson Mandela is responding positively to hospital treatment for a recurring lung infection. The office of President Jacob Zuma also said in a statement that the former president and anti-apartheid leader remains under observation. Mr Mandela was admitted late Wednesday to a hospital in Pretoria, the South African capital. But let us never forget that he contracted tuberculosis during his 27-year imprisonment for fighting white racist rule in South Africa. Since his release he has repeatedly had lung problems. White South Africa has much to feel guilty about and it has been a mark of the strength and genertosity of this great leader that he has always held a hand of friendship out to his persecutors. He is a very rare man and this site salutes him and wishes him every good fortune and a return to good health. Once again the Tories are having to back pedal as their Universal Credit programme shows signs of falling behind schedule and facing major problems. The system, which will roll all benefits and tax credits into a single payment automatically linked to earnings, was expected to be trialled for new claimants across four areas of the country from late April. Unfortunately, and typical ignorance of the simple realities of life, Iain Duncan Smith failed to check out with those who deliver welfare benefits and consequently he has been forced to scale back the trials to a single JCP office in Ashton-under-Lyne. So much for a grand roll-out. Three other pilot areas in Wigan, Warrington and Oldham that were also due to ‘test out’ the new programme will not now begin processing the payments until at least July and possibly later. Of course it would be nice to think that IDS would have the humility to admit to, and display a little embarrassment, but I suspect we may be waiting a long time. This is a man noted for his single-mindedness. No doubt over the coming days we will hear a range of excuses, but the bottom line is that it has been a kick in the pants for the Secretary of State. In February, 2013, Iain Duncan Smith drafted in one of the Government’s most experienced trouble-shooters to take charge of the programme – a move which led to the departure of another senior DWP civil servant a few weeks later. The delay in rolling out Universal Credit are probably due to the fact that most frontline staff do not have the training, computer programmes or experience in place to avoid making disastrous mistakes which could lead to people not receiving the benefits to which they are entitled. A point made by a number of welfare organisations months ago. Could this be more evidence that IDS doesn’t listen to those around him? In its announcement of the delay the Department of Work and Pension made no attempt to explain why it was unable to proceed as planned. Interestingly, in a neat little sidestep a spokesman for the department searched for a way to get IDS off the hook and tried to suggest it was “sensible” to start with one area before rolling it out to the other three in July. “It will allow us to make any changes that we feel we need to make and see what works and what doesn’t”. Liam Byrne, Labour’s Shadow Work and Pensions Secretary, tried to capitalise on this bungling by condemn UC and describing the announcement as “yet another embarrassing setback”. Regrettably, Byrne failed to point out that UC will create significant challenge to low-income families. The simple reality is that, according to a Resolution Foundation report, “Conditions Uncertain”, almost 1.2 million low-paid workers entitled to support under Universal Credit will have to look for extra work or face the risk of having payments withdrawn. Furthermore, in a report by Tanni Grey-Thompson, 100,000 disabled children stand to lose up to £28 a week and 116,000 disabled people who work will be at risk of losing up to £40 per week from help towards additional costs of being disabled. These are injustices that appear to be going through on a nod and a wink. The Tories and their Lib-Dem puppies will force this programme onto the most vulnerable in our society and it is a responsibility of those on the left to expose the extent of these injustices and campaign for their eradication. We have a responsibility to do everything in our power to protect the poor and the vulnerable. If we fail them now we have no right to ask for their support later. It is a truth universally acknowledged that the UK has some of the highest childcare costs in the developed world, and that these act as a significant disincentive for parents who want to work or increase their hours of employment. This barrier is clearly more significant for those on low-incomes who scrabble to pay the same high fees as better-off families from their much smaller budgets, and who have seen a cut in childcare support through tax credits from 80% to 70% of costs since 2011. As a result, the decision this week to route an additional £200 million through universal credit (UC) to help families with childcare is, on the face of it, a welcome announcement. We know that higher levels of parental employment correlate with lower levels of child poverty, and that helping mums back to work is a particularly effective child poverty reduction strategy. However, as always, the devil is in the detail. Additional help with childcare costs over and above what is already on offer for low-income families will only be available through UC for those parents who work a sufficient number of hours to pay income tax. For those in low-paid jobs this is a high bar to hit, and one, of course, that has been raised even further after the chancellor’s announcement this week that the tax threshold will increase to £10,000 a year in 2014/15. As a result, a lone parent will need to work over 31 hours a week at the national minimum wage to reach this threshold, and the same will be true for both partners in a couple. In effect, then, what the new scheme offers is extra help to parents who work all but full-time, while those who wish to start working again after having children, or to combine part-time work with their family commitments, receive no extra support. In this, the government could stand accused of sending out a very mixed message to low-income parents. Under UC, lone parents and second earners will only be expected to work ‘reasonable school hours’ which net out across the year at around 20 hours a week. At minimum wage this would not put them in the taxable bracket, and hence these families would not be eligible for the new upper rate of childcare support. From a child poverty perspective, this new arrangement is also far from ideal. The government’s poverty statistics tell us two interesting things in relation to numbers of hours worked: first, that the risk of poverty drops drastically once a parent enters work; and second, that couple families see another significant reduction in risk once they contain one-and-a-half earners. We also know from focus groups that low-income parents urgently want childcare to help them undertake training and improve their skills. If the government is interested in reducing child poverty, then, this new, two-tier system has got the incentives in the wrong place. Rather than pushing poor parents to work ever longer hours (which, of course, may not even be available), we would most likely see bigger child-poverty pay-outs if higher levels of childcare support were focused on helping all parents enter work in the first place, and to progress to better paid jobs. Alas, an evidence-based approach such as this seems to run counter to a worrying thread emerging from some quarters, that if you are not working ‘enough’ hours you are not really in poverty at all. But if the government is really keen to help hard-working families as it claims to be, it needs to find a more rational way of supporting all low-income parents with the ever-increasing costs of childcare. Those of you who have taken the time to read George Orwell’s “1984” will remember the story of an oppressive society dominated by deceit. A society where facts are distorted to meet the needs of the government and where the people are forced to accept this rule blindly and without question. I recently reread this outstanding novel and could not help draw huge similarities between the society Orwell predicted and the current state of the Welfare to Work industry. No doubt those readers working in that sector will have gasped in horror at such an outrageous statement, but indulge me for a moment and allow me to explain. Now, let’s look at those mottos and see how they apply to the Welfare to work industry. 1. The lifetime risk of Alcohol Dependence is approximately 15% in the general population. In any year, 5% of the general population will actively be suffering from Alcohol Dependence. 2. The lifetime likelihood of being free from any form of alcohol dependence is now 85% in the general population. In any year, 95% of the general population will be from all signs of Alcohol Dependence. Technically both say the same thing, but the conclusion reached by the reader would be quite different, depending on which one was read. It is the same with the “statistics” offered by the W2W industry. Take the figures released a couple of months ago about the “success rate” of the Work Programme. The figures disclosed would suggest that delivery was achieving nothing. Indeed, the evidence would go so far as to suggest that as many people would have secured work without any involvement with the sector. Nonsense, screamed supporters of welfare to work. You haven’t given us time. Wait until another year has passed and you will see how things have improved. But isn’t that a little like a 35 year old inexperienced athlete saying ‘if I’d had another hundred metres I would have beaten Usain Bolt’? The government are quite happy to go along with this subterfuge. Indeed, they have a vested interest in maintaining the illusion that the broad spectrum of programmes are delivering well above target – even if it isn’t true. What they don’t tell us is the number of providers who fail, the number who are forced to give back their contracts and the number who consistently fail to reach targets. A browse through the web pages of Indus Delta or the Department of Work and Pensions would soon give the reader the illusion that the vast majority of long-term unemployed are time-wasting, work-dodging, lazy individuals who do all they can to obstruct the ‘support’ offered to them by providers. Whistleblown mail has come into the hands of this blogger confirming that both JCP and the providers ‘attack’ clients from the underlying assumption they will do all they can to avoid work. As a result, casework is undertaken in a spirit of hostility, where the client/ customer/ service user is brow beaten into accepting the authority of the provider. From the start it is not set up as a help-providing environment but as a controlling one where the client is obliged to do as the provider demands of face the threat of a loss of benefit. Take the case of Geraldine, a mother of two who had been out of work for ten years. When told she would be referred to a Work Programme provider she was excited, believing it would be a certain route to helping her find work. Nine months on and she continues to see her caseworker, who in turn regularly offers her jobs that have expired or are unsuited to her qualifications (she has a degree and masters from Cambridge University in mathematics). Lately, and in desperation, the caseworker has been offering her vacancies in the caring sector. She dare not complain. If she does she might be seen as hindering her chances of work … and so she continues to keep the peace, because if she doesn’t, she fears she might lose her entitlement to benefit. Within every family there are rules – we all grew up with them and we have them in our families today. They range from the simple ‘take your shoes off before entering the house’ to the more intense, such as ‘children should be seen and not heard’. But one of the greatest rules is ‘thou shalt not talk about the rules’. Over the years a number of people have criticised the Welfare to Work industry and their comments are usually dismissed and ridiculed. Media inquiries into the workings of the industry have generally been ignored and their conclusions buried. Tacticus … Why are you in the employment support industry? Your constant arguments are tiresome, totally unprofessional and are becoming an embarrassment to the profession. Tactitus .... MOVE AWAY FROM THE KEYBOARD. Keep it out of reach (I appreciate it may need surgical removal). You do not have to respond to comments. Your hands are controlled by your brain. They do not have a mind of their own. Self-control is key. Interestingly, the Indus Delta webpages have been ‘edited’ and some of the more personal comments raised against me have been removed. No doubt regular readers of my comments will recall them with some disgust. The bottom line is that freedom of expression is not welcome in the sector. Far from being a broad church of ideas, it is a narrow-minded right-wing oligarchy intent on promulgating the policies of a Thatcherite government. All this under the pretence of extending social welfare when the reality is that it is for the great god of profit. Once the ‘customer’ has been referred to a work programme provider they are inducted into the process. This will include the usual overt passing on of information designed to help them understand how WP will work in their lives. The more covert process is to ensure the ‘customer’ realises that the caseworker, along with JCP have the capacity to pull their strings in any way they choose. If they fail to comply they can face the loss of benefit. Equally, if they dare to complain (assuming they are made aware of a complaints procedure and this blogger found a significant number of cases of clients not being informed) the client is likely to be pigeon-holed as a troublemaker and parked. ‘Tammy’ is a Service Desk manager who had been unemployed for 16 months. During that time she had started a correspondence course designed to help him obtain a place at university to study to become a nurse. For a variety of reasons she felt it necessary to complain to her provider about the way she was being treated. Until her complaint they had frequently cancelled appointments without notification, offered her jobs out of the area or requiring her to travel for over two hours each day, and suggested her course inhibited her chance of taking work and informed her that unless she stopped it, the provider might be forced to refer her back to JCP to face sanctions. This is despite her making it abundantly clear she would take any job and work her course around her work hours. Tammy’s case is not unusual. Rather than using motivational and/ or cognitive behavioural processes recognised within other fields, providers use pressure and sometimes gentle bullying to achieve their end. Why? The answer is simple – the vast majority of staff working as caseworkers have had no formal training in motivational change. Many come from a sales background and use those techniques to coerce clients to do what the caseworker sees as being in their best interests. It is a travesty. How can an entire industry, earning so much government money each year justify delivering programmes with untrained and frequently incompetent staff? They have no excuse – other than to explain it as a desire to make more money. And let’s take a closer look at these caseworkers – are they really there to help the customer? Or is their role precisely the same as Orwell’s ‘Thought Police’? An army of pro-provider staff whose sole aim is to monitor client thought processes and guarantee they do not stray from the mainstream. If the client begins to question or desire to have a say in their future they are deemed troublesome and risk sanctions. True there are some caseworkers who genuinely care about their clients, but the good ones soon realise they are facing an uphill struggle and so they leave the sector. Welfare to work has been around for a number of years, but look around the staff and see how many fieldworkers and trainers have been in the sector for over ten years. Nurses, doctors, social workers, teachers stay working on the coalface throughout their careers. Very few Welfare to work staff will do the same. It needs to end. What is needed is for the government to have a radical rethink about the way it helps people back into work. They need to decide what they want, how they want it delivered and who they want it delivered by. Once this has been decided the government should set up a monitoring body capable of removing contracts and sanctioning providers. It should also have the capacity to register staff working in the sector and demand a minimal standard of training. But none of this will happen because just like Orwell introduced the concept of Doublespeak to hide the truth from the populace, so the Welfare to Work sector have created Dolespeak, where lies become truth, where coercion becomes help, where bullying becomes support and where incompetence becomes professionalism. It needs to come to an end, but with the Tories and Labour now entrenched in a core belief that Welfare to Work is the best way forward, despite evidence to the contrary, we are a long way away from sacking the providers. But don’t give up hope – IT WILL HAPPEN. Publius (or Gaius) Cornelius Tacitus (AD 56 – AD 117) was a senator and a historian of the Roman Empire. Tacitus objected to great concentration of power in the hands of the early emperors. Though he hated imperial power and in his writings tries to paint every emperor as a corrupt despot, he hated civil war and anarchy even more. He had a particularly heavy bias against the emperor Tiberius, whom he portrayed as a sinister and cruel emperor, purging his opponents from the Senate by having them tried for treason and executed. He showed scorn for Claudius and Nero, and even his writings about Augustus contained some belittling and snide remarks. His writing is full of tales of corruption, government scandal, and innocent people being destroyed or having their good names ruined because of the emperor's lust for power. It was Tacitus' belief that the emperor had so much power in his hands that no man could occupy the throne without being corrupted by that power.